Has your Corian® countertop been damaged due to overuse, mishaps, and other things that could affect the quality of your countertop? Are you looking for professional Corian® countertop repair in Gilbert? The professionals at AZ Countertop Repair & Refinishing are highly skilled and qualified to repair your Corian® countertop. Not only can we repair your countertop, but we also refinish older, and unappealing countertops to fit your taste and style, as well as professional sink replacement so that your kitchen or bathroom is left looking new and updated with minimal cost and effort. With over 30 years of experience and five star reviews on Google and Yelp, AZ Countertop Repair & Refinishing provides the perfect solution for your countertop project. Corian® is the ideal choice for your Gilbert countertops. Invented by DuPont, Corian® is a solid-surface material composed of acrylic polymer and alumina trihydrate. While those names may not mean anything to you, what will is knowing that these materials create a surface that is strong, heat-resistant and beautiful, creating an ideal countertop for your kitchen. Though Corian® is generally a durable surface, it is not impervious to damage. The surface can easily be scratched, and those scratches are even more noticeable on dark surfaces. If you don’t use potholders or trivets, hot pots and pans can damage the surface, as well. A kitchen accident could even result in small chunks taken out of the countertops. Working with a professional is the best way to restore the surface of your Gilbert Corian® countertops to their former beauty. 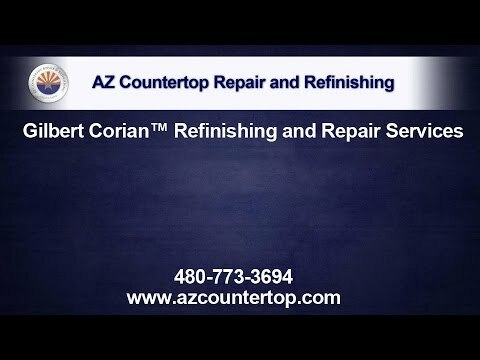 AZ Countertop Repair & Refinishing has 30 years of experience restoring Corian® countertops to their former beauty and ensuring their long life span. At AZ Countertop Repair & Refinishing, Richard Kaiser can oversee even the smallest repairs or take on major projects. Whether your Corian® countertops have only minor surface scratches or they are in need of major structural repairs, we can help you. AZ Countertop Repair & Refinishing prides itself not only on providing the best workmanship in Gilbert, but also on offering the best customer service. Our friendly and professional technicians will perform the job right and will go above and beyond in meeting your expectations for the project and the service. You’ll have a great experience, and you’ll be amazed at how beautiful your countertops look. When your Corian® countertop has become dull and unappealing over the years, check out the Corian® Countertop refinishing services by AZ Countertop Repair & Refinishing! Has your Corian® Countertop developed cracks from years of overuse? With AZ Countertop’s countertop repair services, your countertop will be transformed into its formerly beautiful state! When your sink has been damaged because of frequent use, the experts at AZ Countertop are proud to offer sink replacement and installation services to meet your sink needs! Don’t spend thousands of dollars replacing your countertops. Call AZ Countertop Repair & Refinishing today to repair your Gilbert Corian® countertops instead. You’ll feel like you have all new countertops, and your kitchen will look like it got a facelift.